President Trump makes his case for a crisis at the southern border. We’ll examine his prime-time address to the nation and the extent of his executive powers. 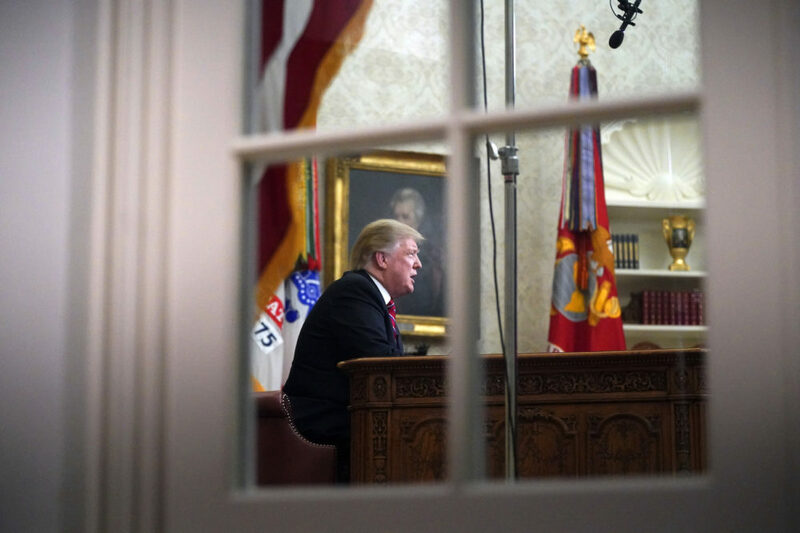 "Trump tried to insist that he had already compromised with Democrats, saying he had moved from a concrete wall to barrier made of steel slats. But Democrats see that as no compromise. Remarkably, he neither offered anything else (like, say, bringing some clarity to the situation of the so-called DREAMers, undocumented immigrants brought to the U.S. as children) nor leveled any threat, like that he could declare a national emergency. "Not offering a compromise or leveling a threat is particularly curious given the point of Oval Office addresses during a tragedy or a "crisis" is to affect some sort of outcome. Congressional leaders are again set to return to the White House Wednesday for resumed negotiations, but don't expect much to come of that. The president on Thursday is headed to the southern border, where he's expected to continue making the case for a physical barrier. "The president's convention acceptance speech ("the crime and violence that today afflicts our nation") and his inauguration speech ("American carnage") were dark visions of the country. And, once again, when speaking to the whole country in a big moment, the president laid out a dark vision. "'How much more American blood must we shed before Congress does its job?' Trump said, pushing for increased border security funding. Trump's view of immigration and immigrants as causing exceptional crime and violence is echoed in conservative media, but is not borne out by facts or data." Politico: "Hill GOP support grows for Trump to make emergency declaration" — "President Donald Trump is keeping everyone in suspense as he considers whether to declare a national emergency to build his border wall. "Republican support for an emergency declaration is growing in some corners of the party, as GOP leaders and White House officials view it as a way out of a shutdown fight they’re losing. Others are unsure, viewing it as the kind of end-run around Congress that the Republican Party harshly criticized Barack Obama for doing. "Though the president has yet to make a final decision, he is unlikely to declare a national emergency in his Oval Office address Tuesday evening, according to two sources with direct knowledge of the plans." "The speech is the latest step in a massive mess President Trump has made of the federal budget in recent weeks. If it were possible to sue for presidential malpractice, this would be low-hanging fruit for the legal community. "Presidents have used televised addresses in all sorts of ways. John F. Kennedy told the nation in October 1962 about the crisis that was taking place over the stationing of Soviet missiles in Cuba, while Lyndon Johnson surprised everyone in March 1968 when he said from the Oval Office that he would not run for re-election. "In similar fashion, Richard Nixon announced his resignation to the cameras and Gerald Ford said that he would pardon his predecessor. These TV speeches have also been used to build support for legislative proposals — such as Jimmy Carter championing energy conservation or Ronald Reagan tax cuts. When the space shuttle Challenger exploded, Reagan used a televised address to comfort the nation. After 9/11, George W. Bush tried to shore up our resolve. "How will President Trump use this address?" Vox: "Several Democratic senators want to block all Senate bills until Mitch McConnell takes up a bill to reopen the government" — "The partial government shutdown is now dragging into its third week, with no immediate end in sight. "Throughout shutdown negotiations, Senate Majority Leader Mitch McConnell has tried to take himself out of the equation as much as possible, saying it’s up to President Donald Trump and House Democrats to figure out a deal before he’ll so much as bring a funding bill to the floor of the Senate. Basically, McConnell wants to know Trump will sign a funding bill before he schedules a vote. "Now, a growing number of Democratic senators want to force McConnell’s hand — by calling for Senate Democrats to block votes on all bills unless it’s a funding bill to reopen the government. The idea started with Democratic Sens. Chris Van Hollen and Ben Cardin, both of Maryland, who floated the plan on Twitter this weekend." The Atlantic: "Worse Than Watergate" — "For decades, Watergate has served as the benchmark against which all other presidential scandals are measured. One sign of its continuing importance in the popular imagination is the use of the '-gate' suffix to indicate scandal: 'Billygate,' 'Lewinskygate,' 'Plamegate,' and far too many others to mention here. "But Watergate’s time as the gold standard of presidential malfeasance might well be coming to an end. If the multiple charges against President Donald Trump prove out, he’ll easily displace Richard Nixon at the top of the Crooked Modern Presidents list. Here’s why. "The Original Sin: The underlying crime in Watergate was a break-in at the Democratic National Committee headquarters, part of a plot to steal documents that might have offered a slight edge in what turned out to be a landslide victory for Nixon. The closest post-Nixon, pre-Trump scandal in terms of severity was surely Iran-Contra, in which high-level officials in the Ronald Reagan administration circumvented Congress to secure military assistance to Nicaraguan rebels. The legal violations were considerable but, as partisans insisted and much of the public believed, the scandal stemmed from a sincere policy position held by the administration rather than the self-interest of individuals. President Bill Clinton’s scandal seemed the inverse: It was deeply personal—an extramarital affair with a White House intern—but the crimes that resulted from it were small-bore. "Although the allegations against Trump are still just that—allegations—they’re far more serious. At the heart of the matter is the possibility that his campaign conspired with a foreign government to influence the 2016 presidential election." This program aired on January 9, 2019.